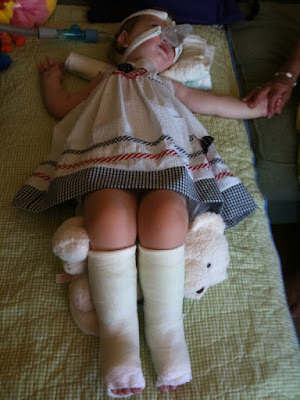 This morning we took Gwendolyn to see her orthopedist, Dr. Early, to have her serial casting performed. Victoria and I were nervous for her, but Gwendolyn was a trooper as usual -- she actually smiled at Dr. Early through almost the entire appointment. The casting took less than 30 minutes, Gwendolyn did great, and we haven't noticed anything strange yet other than the fact that it was hard to get her down for a nap today -- but that could be anything. Her positive spirit and fighter attitude through all that she endures never ceases to amaze and inspire us! 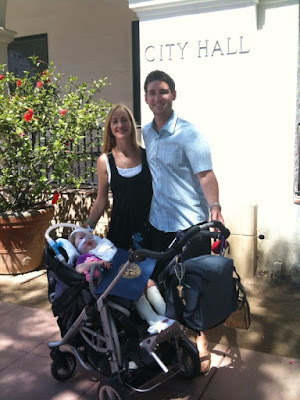 Then, this afternoon -- with Gramma in tow, we went to City Hall to accept a Proclamation from the City of Santa Barbara proclaiming August as SMA Awareness Month. 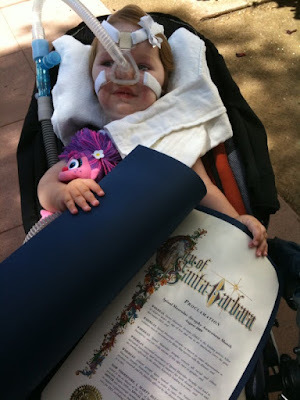 Gwendolyn proudly accepted the certificate from Mayor Marty Blum and she clutched it all the way home. 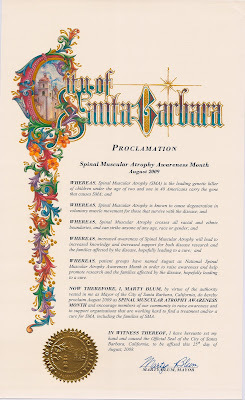 Thank you Mayor Blum and Members of Santa Barbara City Council for furthering our passionate cause to raise awareness of SMA in Santa Barbara and beyond. We greatly appreciate the support!